The owner of a Bury St Edmunds health food shop is breathing new life into the business with a fresh name inspired by a sacred fig tree. 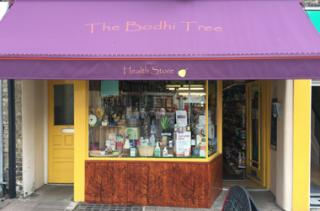 Andrea Hodder took over Butterworths in The Traverse six months ago and this week re-opens the shop under its new name The Bodhi Tree. The name comes from the tree where Buddha attained enlightenment, which is recognised by its heart shaped leaves. The official opening of the store was earlier today (Friday October 21) by the Borough Mayor, Councillor Julia Wakelam. Andrea said: “Butterworths was a much loved business in the town and I thought long and hard about changing from a well-established name, but there is another, previously connected, local business using that name and I thought it was time to put my own mark on the shop. It’s appropriate at a time of great renewal here in The Traverse which is now coming out of the shadow of the Cupola House fire of 2012 – so what better time to breathe new life into the shop. The interior has been rearranged to give what Andrea describes as a more user-friendly layout and now includes a specific gluten-free section. The Bodhi Tree can be found at 9 The Traverse. Its opening hours are 9am to 5.30pm Monday to Saturday.